Roof maintenance, including that of your roof vents, is a necessary task that should be undertaken by all homeowners on a regular basis. This can become a costly expense if you try to bypass quality work for the sake of price. You’ll want to use the services of an experienced, licensed residential roofer because your roof performs one of the most important functions of your home – keeping your family safe. We’ve put together top roof vent tips to ensure you’re getting the best quality work from your roofer. Airflow balance within your attic is achieved by ensuring equal air intake through the vents in comparison to equal exhaust through the vents. This requires proper attic ventilation. Half of the vent area should be higher up in the attic while the other half of the vent area should be lower in the attic. Without proper ventilation, moisture can build up, and heat traps can occur. A good roofer knows the importance of this and won’t let it slide by. Mold and mildew can also form due to improper ventilation and this affects the integrity of your home. Vents should be placed strategically to ensure that balance is achieved. An experienced roofer will do the necessary checks, like a thorough attic inspection. This is done so that we are completely aware of the current structure of the roof and the attic, and so that we know exactly what we’re working with. The outside view of the vents cannot be taken as the whole picture. Once inside your attic, the roofer will be able to provide an accurate diagnosis of what your home needs and how to go about it. 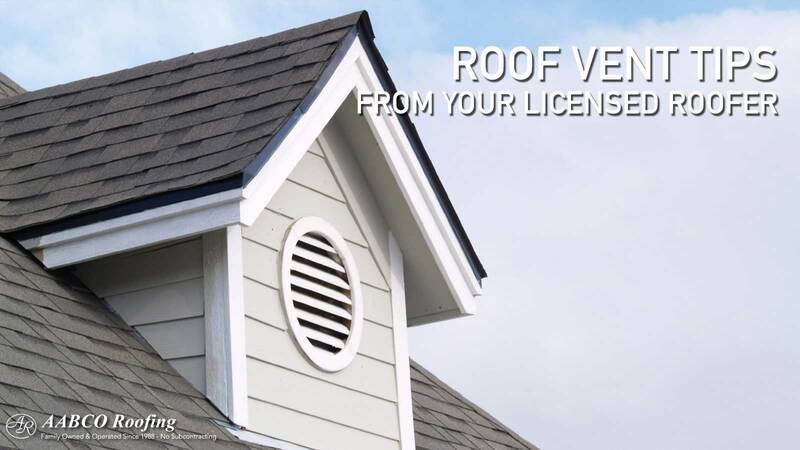 There are various issues that can be affecting your home’s ventilation and without looking from all sides, your roofer will not have an accurate depiction of what the situation is. These types of inspections also give the roofer an opportunity to look out for mold or mildew and give you the chance to address it right away. It is not advisable to mix different types of vents. Experienced roofers know that combining exhaust vents can cause a short circuit in the attic ventilation system. Having different types causes the vents to change their function by becoming intake vents. The problem with this is that they were not designed to be intake sources. By having a mixture of exhaust vents like power fans, box vents or wind turbines, the balance that is trying to be achieved within your attic is thrown. Dark spots on a roof are often a sign of a leak, however, this isn’t always the case. Improper attic ventilation can cause wet areas in your home. Because moist air cannot escape the attic, wet spots occur as the moisture condenses on building materials. Your roofer should go through your house and evaluate any spots you may be concerned about and then provide you with the necessary information you need to fully understand what is occurring. Your attic needs to be as close as possible to that of the outside temperature. In the summertime, the attic temperature should be within 10-15 degrees of the outside temperature. The same applies to cooler months. The idea is that we need to minimize excessive differences in temperature to prevent damage. Balanced attic ventilation will ensure that attic temperatures are maintained. When installing air vents, using the correct materials, down to the type of nails, matters. Ring shank nails are the most effective types of nails to uses to prevent problems which is why they are mandatory in roof repairs and installation. Ring shank nails have grooves or ridges along the part of the nail that enters the wood. This improves the nails holding ability. Your roofer should pay extra attention when fastening the vents to the roof to ensure they are soundly fastened and sealed correctly. Progressive roofers stay on top of the latest industry news and developments that may benefit you as the customer. A progressive trader shows that they take pride in their work and are always on the lookout to better themselves and the service they offer. These are the roofers you want to work with because you know that their offerings are the best of the times. As the customer, we encourage you to ask as many questions as you need to in order to understand the role that roofers play in maintaining the integrity of your roof. At AABCO Roofing we’re always happy to keep the customer educated on all things roofing. If it means we can provide you with the knowledge to ensure the upkeep of your roof, we want to help. If you’re unsure about why something needs to be done, ask for details and allow your roofer to share his experience with you.